The somewhat unpublicised reason why J. Edgar might feel like something of a damp squib to many is that this is a film with a significant set of similarities to films we have already seen. Lead Leonardo DiCaprio did the biography of a weighty 1950s-ish figure some six years ago with The Aviator, director Clint Eastwood has visited real life dramatisations as recently as 2009's Invictus, a period piece just a year prior in Changeling, the topic of the early days of the F.B.I was seen from the other point of view in Public Enemies. So, for a start, J. Edgar comes in at the end of a rather ill-defined curve of connections we've got to know over the last six years or so; DiCaprio doing real life, Eastwood doing mighty period heart, Hollywood visiting (again) something loosely defined as the 1950s. If you can get beyond the feelings of familiarity then the film does face up to you with its own set of weirdly assembled anomalies, most obvious of which are the prosthetic ageing jobs applied liberally to the faces of J. Edgar Hoover (DiCaprio), Clyde Tolson (Armie Hammer) and others. 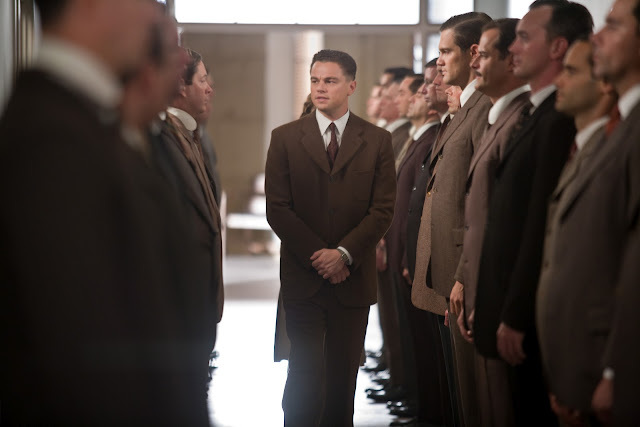 With the framing device running that Hoover is recanting old tales to various junior agents, it's little surprise to see DiCaprio in makeup and thus, everyone else is rather forced to follow suit, including Naomi Watts, whose prosthetics, like DiCaprio's, fit rather well. Hammer's however, fit like something provided by a film from the studio which shares his name, not ageing his face but grimly morphing it into a unrecognisable monstrosity. The first time Tolson appears on screen it is as a silhouette, lurking behind Hoover's office door, almost as if Eastwood is ashamed to reveal him to the watching public. Despite the oddities though, it does feel as though J. Edgar got too harsh of an admonishment upon its cinema release. Hoover has more than enough skeletons in his closet to make his story - ironically a mirror image: his tale is of a man who deals in the currency of skeletal closets - compelling enough and, though some twenty minutes too long, Eastwood motors it along at a pace just on the right side of involving. The chronology of the tale too, played with right up till the final reel, helps, as we jump from an ageing Hoover's regrets to a young Hoover's proudest successes, the foibles of a controversial figure never far away. If the film fails to answer some questions - why does Hoover have a gigantic plastic-looking swordfish above his desk, for instance - then it is because Eastwood's focus is too broad and, certainly, more time spent getting into the details of Hoover and Tolson's relationship could have borne greater praise for the film but, even as it is, with bad makeup and other foibles, this is still a fairly engaging period biopic, from people who know the genre, perhaps even a little too well. J. Edgar is released on DVD and Blu-ray in the UK on Monday 11th June.